Halloween is one of the busiest days in hospital emergency rooms. Pumpkin carving snafus, seances gone wrong, exorcisms--don’t you think the staff could probably use all the helpful hands they can get? We don’t actually advocate your kid doing surgery (unless they are a very special child doctor of 80s TV fame) but we DO advocate for your child to dress like an ER doc and enjoy the energy rush that comes along with saving lives! 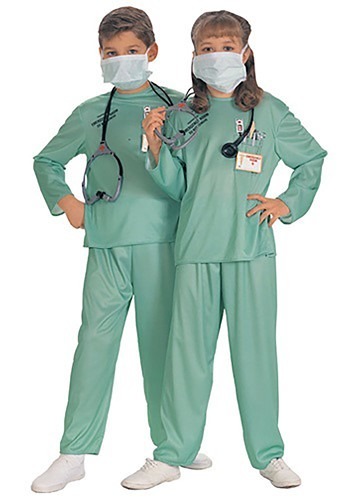 Your kiddo can feel just like an in-demand smarty-pants this Halloween when you get them this Child ER Doctor Costume, STAT! (Do docs really say Stat? We’ve always wondered.) And while--we repeat--we do not actually want your child to try and manage a triage unit just yet, it would be really fun to see them building up their skills by bandaging up the scrapes and bruises of their pals while out trick-or-treating. After all, every ER doctor has to start with the basics of first aid! In this set of green soft scrubs, your kiddo will be all set to take care of minor medical emergencies and maybe even some bigger surgeries (on their toys). They get a nifty and official looking ER name tag; that, along with this costume’s surgical mask and flexible stethoscope, will ensure that your little one can get a taste of life as a real doctor! And who knows? That inspiration may just prove a life-saver when they are stuck in all-night study sessions for the MCATs down the road!